There are many models for understanding how people can do superb work. 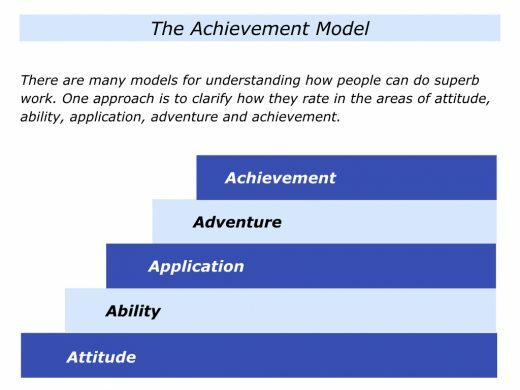 One approach is to clarify how they rate in the areas of attitude, ability, application, adventure and achievement. Imagine that you are recruiting people for your team. How can you be a good talent spotter? How can you tell whether a person is hungry? How can you judge whether they will translate their potential into performance? This article outlines five qualities you can look for to recognise potential achievers. But one point is worth underlining. A person may be an achiever in one or two specific areas of brilliance but not necessarily in others. The talent spotter’s role is to identify where the person has both the will and the skill required to deliver the goods. If appropriate, it is then to work with them to create a win-win – a win for the organisation and a win for person. Before interviewing a person, you can clarify the qualities somebody must demonstrate to succeed when performing a specific activity or role. One approach is to clarify what an A Player would be delivering when doing the work. You can do this by describing the following things. 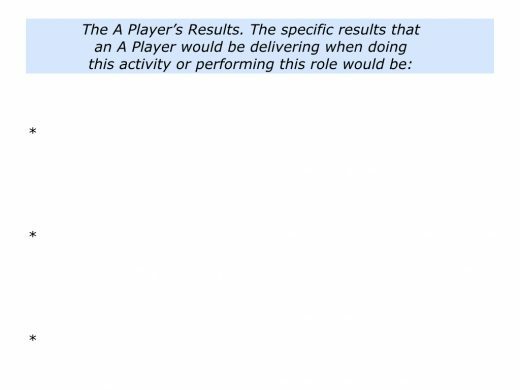 The specific results that an A Player would be delivering when doing the activity or performing the role. 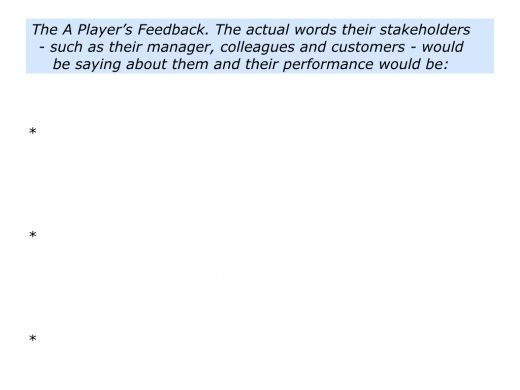 The actual words that the A Player’s key stakeholders – such as their manager, colleagues and customers – would be saying about the person’s performance. 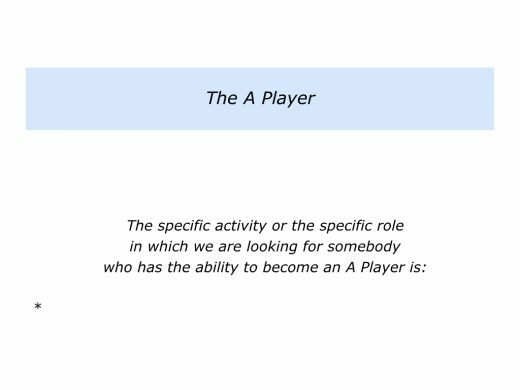 These answers can provide a framework you can use when clarifying the person’s present performance – and their potential – in relation to becoming an A Player. Here is the exercise on this theme. Imagine that you have clarified the qualities a person will need to demonstrate. The following pages describe themes you can explore regarding the likelihood of them being able to deliver the goods. Imagine that you are interviewing a person, looking at an example of their work or watching them in action. Here are some themes to explore about the person and their performance. What is the person’s attitude? Are they positive or negative? Will they bring positive energy to the team? How do people feel about them? Do they take responsibility or avoid responsibility? Will they be good at making clear contracts with people? Will other people be confident that the person will fulfil the contract and deliver the goods? Do they have the drive to succeed? Do they also have the desire to help other people – such as their manager, colleagues or customers – to succeed? What is their style of interacting with other people? What is their style of communicating? Do they operate in a way that supports people or stops people? Are they proactive? Do they aim to make things happen or wait for things to happen? Are they resilient? Do they have the ability recover from setbacks? Adam Grant’s work showed that people in organisations can choose to be Givers, Matchers or Takers. Does the person come across as a Giver, Matcher, Taker or as a combination of these styles? Is the person self-managing? Do they behave like an adult or will they be high maintenance? Will they be good at managing upwards and proactively keeping other people informed? If the person was asked do some pre-work before an interview, what was their approach to the task? Was it professional or was it careless? Attitude is the starting point. A person can have great ability, but if they have a poor attitude this can create collateral damage. If you wish, try tackling the exercise on this theme. Imagine you are interviewing a person, watching them in action or seeing an example of their work. This exercise invites you to do the following things. 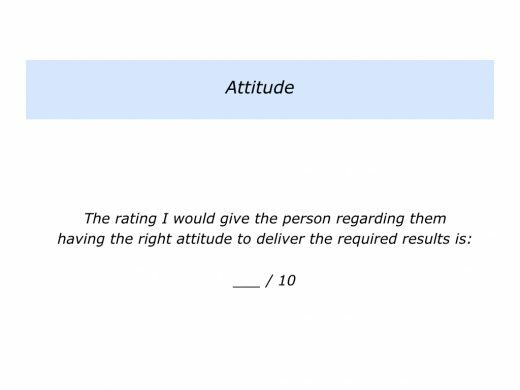 Describe the extent to which you believe the person has the right attitude to deliver the required results. Rate this on a scale 0 – 10. 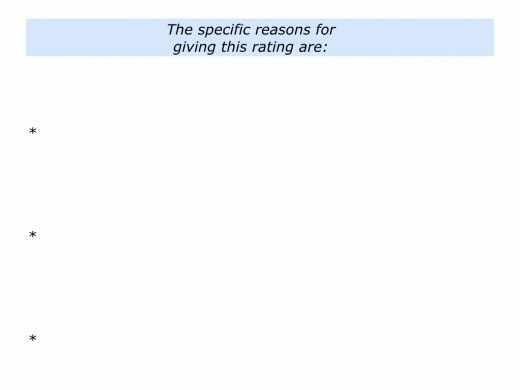 Describe your reasons for giving this rating. Describe what the person can do to maintain or improve the rating. You are looking for a rating of 7+. Anything below that is a big danger signal. Then move onto the next stage. The person may have a fine attitude, but they also need to demonstrate the required ability. The strengths you will be looking for will obviously depend on the type of work you are asking them to deliver. You will be looking for different qualities when hiring somebody who is expected to do good work as a counsellor, nurse, chef, doctor, scientist, soccer player, trouble shooter, leader or in some other role. How can you clarify whether a person has the required ability? The best way is to see them in action or to look at an example of their work. You can give them a task in which they need to demonstrate their professional ability. If this is not possible, it is important to clarify their strengths and successful style of working. How to take this step? To describe two satisfying projects – in the broadest sense of the word – that they have done in their life. To describe what made each of these projects satisfying and to look for any recurring patterns. To clarify their successful style of working – such as the principles they followed to do satisfying work – and how they may want to follow these principles in the future. People develop, they seldom change. You can therefore clarify whether or not they already have within them the successful pattern that they can apply to the required piece of work. If you are looking for a co-ordinator, for example, you are looking for somebody who says some of the following things regarding what they find satisfying. I like to make things work. I enjoyed organising the social events at University. I still organise the annual ski trips some of us take. At work I am often used to make sure projects are delivered. I just love to make sure thing work properly. You will be looking for a certain successful patterns depending on whether you are hiring for a co-ordinator, a visionary leader, a people manager, a marketer or whatever. Imagine that you are interviewing a person, looking at an example of their work or watching them in action. Bearing in mind what you are looking for, here are some themes to explore when considering whether the person has the required ability. What are the person’s strengths? What are the specific activities in which they consistently deliver As rather than Bs or Cs? When are they in their element – at ease and yet able to excel? When do they do satisfying work? What are the kinds of work they love to do? What are the activities – the task, projects or other kinds of work – that give them positive energy? What are the kinds of work in which they see the destination quickly? When do they go ‘A, B … and then leap to …Z’? What are the kinds of work in which they have a track record of delivering Z? What are the activities in which they see patterns quickly? What are those where they have good radar – they seem to know what will happen before it happens? What are those where they have the radar and the repertoire required to deliver the desired results? What are the activities where they make complicated things appear simple? What are those they find fascinating, have a feeling for – are good at – and have a track record of finishing? What is the person’s successful style of working? Looking back, what for them have been two deeply satisfying projects? What did they find satisfying? What were the principles they followed? Will their successful style fit with what we are asking them to deliver? If they will be working with customers, do they have the desire to give good customer service? Can they give examples of when they have given good customer service? Will they be good at managing both internal and external customers? Let’s move on to their decision making ability. Bearing in mind the activity they will be doing, will they make good decisions? Will they be good at strategic thinking? Will they establish clarity about the real results to achieve? Will they explore all the possible choices? Will they clarify the consequences – the pluses and minuses – of each option? Will they explore the other possible creative solutions? Will they commit to their chosen option and make a clear action plan? Will they make clear contracts with all the key stakeholders? Will they then deliver the desired concrete results? Bearing in mind the answers to these themes, you may wish to tackle the following exercise. This invites you to do the following things. Describe the extent to which you believe the person has the ability to deliver the required results. Rate this on a scale 0 – 10. Application is vital. The person must be prepared to keep doing the basics before then, when appropriate, adding the brilliance. Great workers plan properly. Bearing in mind what they can control, they clarify the real results they want to achieve. They then translate this into a clear picture of success. They clarify the key strategies they can follow to give themselves the greatest chance of success. They then translate these into a clear action plan. Such workers also anticipate any potential problems. They clarify: a) How they can prevent these problems happening; b) How they can manage these problems if, despite everything, these challenges do happen. They then rehearse working towards achieving the goals. They rehearse pursuing the key strategies and also rehearse managing any potential challenges. Great workers click into action when entering their version of the arena. They are self-disciplined and apply themselves properly. They keep doing the right things in the right way on the way to achieving the desired results. Such workers keep reading reality. They focus on: a) The specific things that are working and how they can do more of these; b) The specific things they can do better and how. They then refocus on achieving the picture of success. A person may have the required ability, but they may not be prepared to apply themselves properly. This takes us on to considering the much discussed quality called grit. Great workers have both the gifts and the grit required to deliver great results. But it is important to be careful when discussing grit. To clarify whether they have the desire to apply themselves to do such activities in the future. This final point is crucial. A person may have a pattern of applying themselves to doing a particular activity, but they may no longer have a strong desire to do so. They may want to do other things in the future. Bearing in mind the work you want done, look for somebody who has the required drive, attention to detail and desire to deliver the goods. They are then more likely to apply themselves and achieve the goals. Imagine that you are interviewing a person, looking at an example of their work or watching them in action. Here are some themes to explore when considering whether the person has the required application. Does the person have natural self-discipline in the specific activity? Do they look ahead and prepare properly? Do they clarify the real results to achieve? Do they clarify the picture of success? Do they clarify the key strategies they can follow to achieve success? Do they anticipate the potential challenges? Do they anticipate ways to manage these challenges? Do they make clear action plans? Do they make clear working contracts with the key stakeholders – such as their manager, customers and colleagues? Do they know how to proactively keep their key stakeholders informed about their progress towards achieving the goals? Do they know how to get a quick success that will reassure their key stakeholders? Does the person then apply themselves properly? Do they keep following good habits? Do they do the right things in the right way every day? Do they keep doing the basics? What are the person’s strengths? How do they use these to perform superb work? How do they manage the consequences of their weaknesses? What is the person’s style of working and what are the consequences – both for themselves and for other people? What are the pluses and minuses of their style? Do they consistently deliver high professional standards? Do they behave in a professional way towards both colleagues and customers? Do they manage upwards in a professional way rather than a political way? To manage by outcomes rather than by tasks. Will the person follow these leadership principles? If so, how will they translate these into action? How will they encourage and enable the team to achieve success? Looking at the results the person will be asked to deliver, will they apply themselves? Do they have the drive, the attention to detail and the desire to deliver the required results? Will the person keep reading reality to see what is actually happening? What will they do to build on what is working? What will they do to improve what is not working? How does the person manage both successes and setbacks? What do they do to build on successes? What do they do to manage setbacks? Is the person mainly introvert, extrovert or a combination of both? If they are mainly introvert, how do they create the time and space to concentrate and do deep work? If required, how do they then go into role to help others – such as going into role as a trusted advisor, leader, team member or another role? How do they prepare to go into role? How do they then behave when in role? If they are mainly extrovert, how do they use this style to help others? How do they channel their energy in a positive way? How do they inspire rather than intimidate others? How do they show respect for other people’s styles? 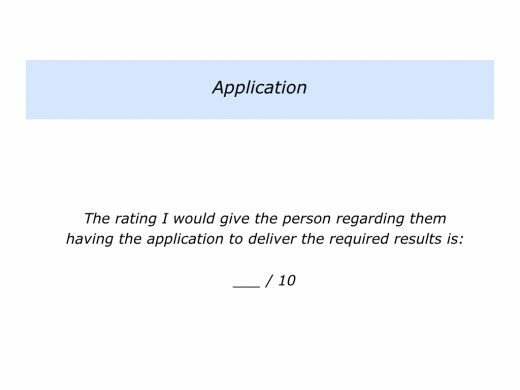 Describe the extent to which you believe the person has the application to deliver the required results. Rate this on a scale 0 – 10. Great workers apply themselves properly. They also, when appropriate, demonstrate some of the adventurous qualities required to deliver the results. Such workers get the right balance between consistency and creativity. They keep doing the maintenance but sometimes do something extra to make a breakthrough or produce a piece of magic. Looking at the activity you want the person to do, consistency may be crucial. This will certainly be the case if you are hiring a pilot, accountant, surgeon or other professional who is expected to maintain consistently high standards. Some kinds of work also require a person to, when appropriate, be adventurous. This can take different forms. You may want the person to be innovative, find creative solutions or build a successful prototype. Imagine that you are interviewing a person, looking at an example of their work or watching them in action. Here are some themes to consider when exploring whether they demonstrate adventure. Looking at the specific activity the person will be doing, will there be occasions when they need to be adventurous? Will they need to be innovative, find creative solutions or show other adventurous qualities? Does the person demonstrate any of these qualities? When have they taken initiatives, been creative or managed a crisis successfully? When have they shown other adventurous qualities? What did they do right then? What happened as a result? Does the person have a hunger to learn? Do they like to explore ideas and make sense of the information? How do they use the knowledge they have gained? Do they use it to improve themselves, to help other people or to do both? 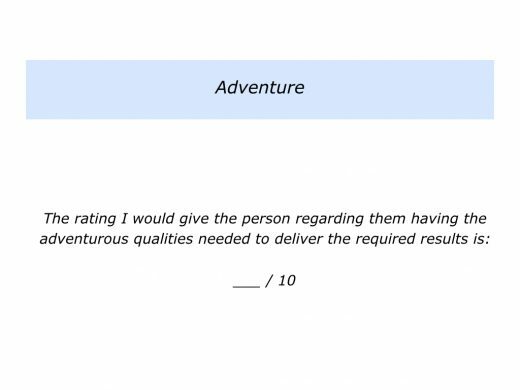 Bearing in mind the results the person needs to deliver, consider the adventurous qualities they need to demonstrate. You can then try tackling the exercise on this theme. Describe the extent to which you believe the person demonstrates the adventurous qualities needed to deliver the required results. Rate this on a scale 0 – 10. Great workers are good finishers in the activities in which the excel. Different people choose different ways to finish successfully. Some people continue to do the basics and then, when appropriate, add the brilliance. Some continue to be persistent and perform superb work. They find creative solutions to challenges and sometimes do something special to produce peak performances. Some continue to maintain high standards. They then produce a piece of magic to deliver the goods when it matters. Some go into their equivalent of the zone. They flow, focus and finish. Some reach the goal by adding that touch of class. The specific things they can do better – and how – in the future. Such people then rest and regather their strength. When they feel ready, they focus on the next challenge. Clarifying the real results to achieve, they then do their best to achieve the picture of success. Imagine that you are interviewing a person, looking at an example of their work or watching them in action. Here are some themes to consider when exploring whether they will achieve the desired results. Looking at the activity we want the person to perform, what are specific results we want them to deliver? What is the likelihood of them delivering these results? Let’s revisit their positive history. What is the person’s track record for finishing successfully? When has the person done a similar activity and delivered the desired results? What did the person do right then? What were the principles they followed? How can they follow similar principles – plus maybe add other skills – to produce the results we want them to deliver? Let’s consider their motivation. How motivated is the person to do the work? Will they find the work satisfying? Do they really want to deliver the desired results? How can the person build on their strengths when doing the work? How can they follow their successful style? How can they manage the consequences of their weaknesses? Will the person make a good contribution to the organisation? Will they be prepared to create a win-win-win? Will they create a win for the organisation, a win for their customers and a win for themselves and their colleagues? Will the person be self-managing? Will they embody the concept of continuous improvement? Will they encourage their colleagues and help them to succeed? Looking at the practical aspects, what support will the person need to deliver the goods? How can we encourage and enable them to do superb work? What else can we do to increase the chances of achieving success? Bearing in mind the results the person needs to deliver, you can consider the likelihood of them achieving the goals. If you wish, try tackling the exercise on this theme. 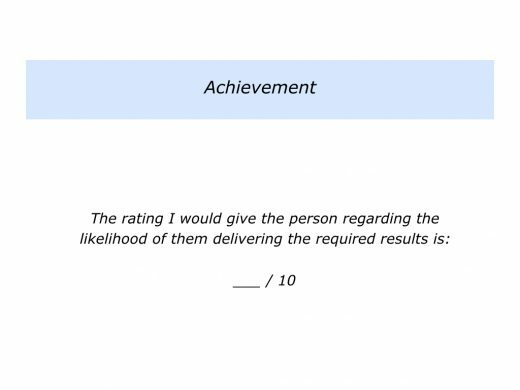 Describe the rating you would give the person regarding the likelihood of them achieving the required results. Rate this on a scale 0 – 10. It is time to make a decision regarding the person’s suitability for doing the activity. One approach is to start by completing the exercise at the end of this article. This invites you to revisit the ratings you have given the person in all five areas. Based on these findings, you can decide if you want to take the discussions further with the person. Several factors are worth bearing in mind when making the decision. First, it is vital for the person to score at least 7+ in the areas of Attitude, Ability and Application. These provides the basis for them making a fine contribution to the team. Second, if you decide to hire the person, you can then help them to clarify their strengths and make clear contracts about their best contribution. You can also provide the support they need to deliver the goods. Third, if appropriate, you can invite the person to rate themselves in each of the five areas. This can lead to a fruitful conversation and provide the basis for building a development plan. You can then work together to achieve ongoing success. Finally, if you decide not to hire the person for the role you can decide on the next steps. If appropriate, you can consider whether they have the right spirit and strengths to make a different contribution to the team. If so, you can explore with the person how they could make such a positive contribution. If not, you can explain the qualities they would need to demonstrate to be considered in the future. 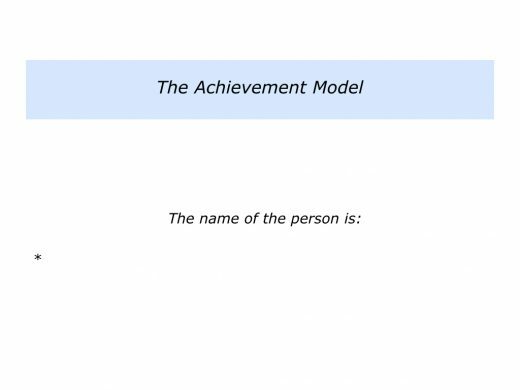 If you wish, try tackling the final exercise on regarding the achievement model. Looking at the person, this invites you to do the following things. 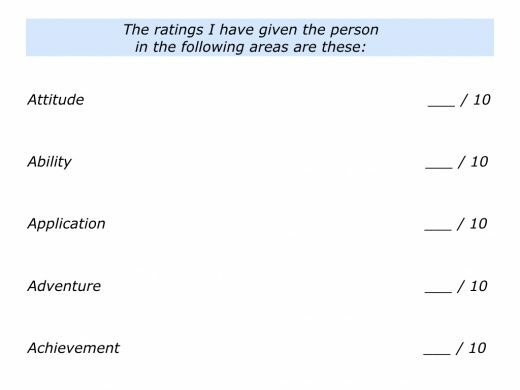 Describe the ratings you gave the person in each of the areas. Bearing in mind these ratings, describe your recommendations regarding the next steps with the person.